Everton missed the chance to move second in the Premier League as Christian Benteke earned Crystal Palace a deserved point at Goodison Park. The hosts led when Romelu Lukaku curled a 20-yard free-kick over the Palace wall and into the top-right corner. Palace improved after the break, levelling when Benteke met Joel Ward's cross with a towering far-post header. The visitors almost claimed a fourth straight win but Damien Delaney's header was ruled out for offside. The point was enough to move the Toffees up to third place, four points behind leaders Manchester City, though the rest of the weekend's top-flight fixtures are still to be played. The Eagles, who continued their recent revival after taking just one point from their opening three matches, remain seventh. Ahead of kick-off Palace might have settled for a point against an Everton side that has made an impressive start under Ronald Koeman, but they perhaps left Goodison Park aggrieved not to take all three. There was some debate over the free-kick from which Everton scored, awarded after Delaney - making his 600th career appearance - raised his boot as he tried to clear a loose ball. 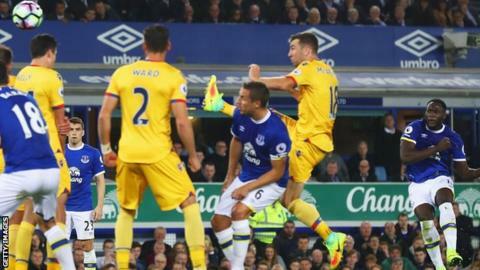 The ball hit Everton captain Phil Jagielka's raised arms but referee Jonathan Moss penalised the Palace defender, awarding a free-kick that Lukaku converted with a sublime strike. "It was a harsh decision. Jags put his head down a little bit," Delaney said afterwards. Palace also questioned why Delaney's second-half header from Ward's clipped pass was ruled out for offside. Delaney was in an onside position when the cross came in but television replays showed team-mate James McArthur had strayed offside and was perhaps blocking Maarten Stekelenburg's view when the defender headed the ball into the net. But there was still confusion after the match. Delaney said he been told by the officials that McArthur had been penalised, while Eagles manager Alan Pardew claimed assistant referee Simon Bennett told him Delaney was offside. "I gather the TV replays show Damien wasn't offside," said Pardew. "If that's what the assistant referee's call was then we can feel a bit hard done by on that one." Everton and Palace rely on burly Belgians to spearhead their attacks, so it was no surprise to see both Lukaku and Benteke on the scoresheet. The pair are battling for Belgium's number nine shirt and there was little to choose between them at Goodison Park. While Koeman has told Lukaku that he must press opposing defences more, his finishing is clinical - and he again demonstrated his ability by bending in his fifth goal in three Premier League matches. But former Liverpool striker Benteke was not to be outdone. The £27m summer signing has provided a much-needed physical presence up front for Palace, and used his aerial ability to pull his side level. He showed intelligence to peel off Jagielka and move to the far post, where he rose above Seamus Coleman to direct a wonderful header into the opposite corner. "It's a good point in the end. We defended set plays and second balls well against a difficult team. "The team performance was outstanding, although we'd like to create more opportunities. "I thought we played very well and showed our quality and resilience by coming back from behind again. "Everton had a couple of spells early on where you could see their quality. They took the lead but we wouldn't lie down. We bossed the second half. "I'm happy with the performance of the team and the point." Crystal Palace are now unbeaten in their last four Premier League visits to Goodison Park, winning two and drawing two. Lukaku has scored in four of his last five Premier League appearances against Palace. Lukaku now has five goals in his last three Premier League appearances - this after a run of 11 consecutive appearances in the competition without a goal. Since Benteke's Premier League debut in September 2012, only Olivier Giroud (also 19) has scored as many headed goals. Benteke has scored five Premier League goals against Everton, only netting more against Sunderland (seven). Crystal Palace have now gone 12 successive Premier League games without keeping a clean sheet. This was Ronald Koeman's 100th competitive game in charge of an English club - winning 49, drawing 19 and losing 32. There were nine yellow cards shown by referee Jon Moss - the most in a Premier League match this season. A two-week break from the Premier League. Everton resume after the internationals with a trip to leaders Manchester City on Saturday, 15 October (15:00 BST), while Palace host London rivals West Ham later that day (17:30 BST). Match ends, Everton 1, Crystal Palace 1. Second Half ends, Everton 1, Crystal Palace 1. Tom Cleverley (Everton) is shown the yellow card for a bad foul. Corner, Everton. Conceded by Wilfried Zaha. Yannick Bolasie (Everton) is shown the yellow card for a bad foul. Attempt missed. Seamus Coleman (Everton) right footed shot from the centre of the box is too high. Assisted by Romelu Lukaku. Substitution, Everton. Ramiro Funes Mori replaces Bryan Oviedo. Attempt missed. James Tomkins (Crystal Palace) right footed shot from outside the box is high and wide to the right. Assisted by Joe Ledley with a headed pass. Substitution, Everton. Kevin Mirallas replaces Ross Barkley. Attempt saved. James Tomkins (Crystal Palace) header from the centre of the box is saved in the bottom right corner. Assisted by Joel Ward with a headed pass. Attempt blocked. Christian Benteke (Crystal Palace) header from the right side of the six yard box is blocked. Assisted by Jason Puncheon with a cross. Corner, Crystal Palace. Conceded by Tom Cleverley. Attempt blocked. Joel Ward (Crystal Palace) left footed shot from outside the box is blocked. Attempt blocked. Wilfried Zaha (Crystal Palace) left footed shot from the right side of the box is blocked. Corner, Crystal Palace. Conceded by Seamus Coleman. Corner, Crystal Palace. Conceded by Bryan Oviedo. Offside, Everton. Bryan Oviedo tries a through ball, but Yannick Bolasie is caught offside. Andros Townsend (Crystal Palace) is shown the yellow card for a bad foul. Attempt missed. Phil Jagielka (Everton) header from the centre of the box misses to the left. Assisted by Ross Barkley with a cross following a corner. Corner, Everton. Conceded by Martin Kelly.